Last weekend’s Sunday Politics on BBC One devoted a large segment of the programme to the subject of the new Superhighways in London. A roving reporter had been duly despatched to examine Superhighway 5, running between Oval and Vauxhall Bridge Road. Besides asking drivers sitting in traffic what they thought of the new scheme (a ‘disaster’, unsurprisingly), the reporter managed to capture congestion on the road while the Superhighway was empty, the result of a broken down lorry blocking one of the lanes. A casual observer would probably come to the conclusion that the Superhighways are therefore a waste of space, ‘causing’ congestion on the road network, for little or no benefit. But note that the footway here is also empty. Nobody was walking along this road at the time this footage was taken. Is that a problem? Does that mean that under-used footways on both sides of this road – and indeed alongside other congested roads – are ‘causing’ congestion? Should they be trimmed, or even removed altogether? Of course not – nobody thinks like this, because footways are an established part of highway design. Walking is a legitimate way of getting about towns and cities, and we don’t think twice about footways being provided for walking on both sides of the road, even if that is valuable space that could be used to ease congestion for motorists. Parking of motor vehicles also takes up valuable space on main roads; space that again could ease congestion for motorists. If we look back in time to just last year, we can see that the exact same spot the BBC chose to film a ‘waste of space’ in the form of the new Superhighway, an awful lot of highway space is being ‘wasted’ in the form of on-carriageway parking, on both sides of the road. ‘I tell you what, mate, all this on-street parking is a total disaster. It’s a disaster, and Boris has to go.’ Said nobody, ever. If cycleways ’cause’ congestion, then surely the same is true for the on-street parking in the picture above, which reduced this road to effectively just one lane for motor vehicles at this point. But again, clogging up through roads with parking in this manner is ‘legitimate’; it’s completely ordinary and background, and nobody bats an eyelid or attributes causality, even when they are stuck in a queue right beside parked vehicles taking up valuable highway space. Cycling, by contrast, isn’t ‘legitimate’. It’s not seen as an ordinary mode of transport for everyday people, and that’s why we are seeing these curious reactions to the repurposing of highway space. Unlike footways, bus lanes, and parking bays – all of which take away valuable road space that could be used for free flow for motorists – cycling isn’t taken seriously, even when these new, isolated pieces of infrastructure, that aren’t part of a coherent network of cycle routes, are shifting people more efficiently at peak times than a motor vehicle lane that takes up an equivalent amount of space. This is also why the BBC Sunday Politics programme – which has never even glanced at the major difficulties people walking around London face on a day-to-day basis, managed to focus with a straight face on the difficulties the Superhighways present to pedestrians. I doubt that one word has been spoken recently into a BBC camera about junctions in the city where there are no green signals for pedestrians; or junctions where there are no dropped kerbs; or pavements completely obstructed by parked motor vehicles; or awful pig-pen pedestrian fencing; or staggered crossings. While they have made the road better for cyclists, have Transport for London really just made it a worse place for pedestrians and people who want to use the bus? Eye contact – man waves person cycling through. This selective concern for pedestrian comfort again flows from legitimacy, and the established order. The established order has motor traffic flow at the top of the tree, with pedestrians waiting minutes just to cross the road, or corralled into zig-zag crossings, or prevented from crossing roads altogether. This passes without comment, because it is ordinary, and legitimate. We can’t imagine things any other way. A typical London street scene. The road clogged with four rows of motor vehicles, pedestrians on tiny pavements, compromised further by utilities and street furniture, and no pedestrian crossings. But this isn’t a matter of concern, because it is legitimate and ordinary. We have systematically – over a period of several decades – made roads and streets in our urban areas very very bad indeed for pedestrians. In that context, asking whether some new cycling infrastructure has made things a bit worse for them is an absurd distortion of priorities, a perspective that only really makes sense against a background assumption that cycling is an ‘illegitimate’ mode of transport in urban areas, that doesn’t deserve serious consideration. These are problems of perception that will be hard to shift, and perhaps will only be shifted once this new infrastructure -incomplete as it is – itself establishes new patterns of behaviour. Until then it’s worth reminding ourselves that these ‘issues’ with cycling infrastructure really flow from starting assumptions about legitimate uses of road and street space. As bad as the pedestrian environment often is, I can’t agree with your statement that people walking get worse treatment than people cycling, principally because pedestrians have – for the most part – a subjectively safe environment. Yes, there might be more inconvenience, but that is only mitigated relative to people cycling in heavy traffic, which is something the vast majority of people aren’t even prepared to do. Though the number of people cycling in heavy traffic on main roads out of town, small as it understandably is, is still larger than the number of people prepared to walk in those circumstances. And the experience of walking on urban streets with busy traffic and no pavements (India, for instance) although many people do it – because they have no alternative – is far more unpleasant than cycling on the same streets. My subjective impression is that walking in London has gotten more difficult over recent years, largely due to what seems to be an explosion in pavement parking and even pavement driving. Maybe this is due to the city’s recent population boom combined with cars getting physically larger? But drivers really seem to have developed a sense of entitlement regarding parking, in that apparently the lack of anywhere else to park within yards of their destination automatically entitles them to do so on the pavement (that’s invariably the response you get if you ever challenge them for blocking the pavement in front of you “there’s nowhere else to park”). Maybe because people have become unaccustomed to walking even a hundred yards? And councils pander to this by painting parking bays on pavements, and then drivers spill out of them or park on the rest of the pavement where they aren’t supposed to (probably similar to how shared pavements encourages cycling on pavements in general). Though Gilligan & Van Deurs argued the case quite well. In other words, we live in a culture where it is “common sense” or acceptable to accept the many and varied disbenefits of car-centredness as “natural”. 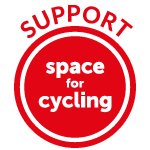 Even campaigners and peole who think they are pro-cycling will – unintentionally – do this. One way to assist in getting out of this is to look at the language used. 1. “Traffic”. Do you mean “motor traffic” or Pedestrian traffic”? Or “cycle traffic”? No reason why it should be restricted to motors – but then somehow we are brought up to regard the motor vehicle as the one which is important. 2. “Dangerous”. Do you mean dangerous TO other road users, or at risk FROM danger from – in general – motor vehicles. I think it’s worth thinking about this. As a frequent pedestrian, casual cyclist, and very infrequent driver (via car club), I’m generally very supportive of re-allocation of road space away from vehicles to pedestrians and cars. It’s great to see that the infrastructure on CS5 now means that families with young children can now use it. However, I don’t think it’s right to dismiss the impact on pedestrians out of hand – and I think some cyclists do need to behave in a more considerate manner. Much like cyclists, pedestrians are vulnerable road users. Yet using a pelican crossing on CS7 during the the morning peak feels decidedly unsafe, with some cyclists choosing to blast through red lights (or flashing ambers) whilst people are trying to cross. Equally, not all cyclists choose to show considerate behaviour through bus stop bypasses. Whilst no obligation to slow down or yield – it would make sense for people to at least show caution and consideration out of simple decency. I presume by your use of the words “some” and “not all” you are saying that many people on bikes *are* showing “caution and consideration out of simple decency”. The problem is that in any sufficiently large group you will find a section of people who do not do this – even among pedestrians I dare say. Why should a section of bike riders be any different? The highly regulated motorists certainly aren’t. The answer is to shift the considerate who are currently on foot and in motors onto bikes so that the actions of the boorish ones are rendered simply impossible through sheer numbers, as you see on, for example, Mark Wagenbuur’s videos from the Netherlands. You’ll only do that by making conditions for cycling attractive. As other European nations realised 30-40 years ago. In the meantime it’s kind of the price you have to pay for having encouraged an aggressive carriageway culture, where “caution and consideration” has to take second place to assertion and keeping oneself safe, and the young and elderly are largely excluded. What you’re seeing is this cohort being the first on to the tracks. Hopefully a temporary situation – keep calm and carry on. Otherwise, on the broader topic of legitimisation, note that in contrast to many peer nations, the UK was very quick to ban swegways from the streets. I was reading an article about post-war generations in Britain and their general attitudes the other day. The author put forward the idea that the baby boomers brought up a generation that was especially “risk averse and entitled”. Since these are the generation in full maturity today and have the greatest say, it kind of fits that there is thus a climate where bicycles may be de-legitimised, and swegways banned. The author also said the current late teen generation are pointing the finger at the previous ones with the simple accusation “you spoiled it all”. I know it’s stereotypically what teens say, but they may well be correct here, and I hope they will help do something about it. True, but when being a pedestrian myself I find motorists to be a far bigger issue. Everything you say about cyclists blasting through lights applies, with far greater associated risk and in far higher numbers, to motorists. Its just that people are so accustomed to it barely registers. The issue of everyone behaving better on the roads is, it seems to me, a separate topic from the allocation of road space. (I favour auto-cannon turrets at crossings and junctions, to automatically dish out instant justice to anyone detected as breaking the rules – once past the inevitable teething troubles where prams are mistaken for cars I’m sure it would work well!). I think it is a type of ‘racism’, which for some reason is generay seen to be acceptable if against people who use a bicycle. We need to speak out as you are doing against this predjudice, well done. Its worth to compare the situation in holland. Although i do not have the figures to support but pretty sure the ratio of cyclist to cars would have gone up dramatically vompared to the time before they built bike routes. Lot of people wont agree now but once they see this safe cycling on this busy city they would switch to bikes soon. So we will see the bebefit in few years. This is an inivatation now especially those who like to cyvle but reluctatnt due to the fear of safety. So the question how long it will take to recover to cycling levels similar to NL is difficult to infer I’d say. Britain is a disaster for vulnerable road users, ie pedestrians, cyclists, children, disabled people, the elderly. Still not got really used to it after 20 years. Please start to take experiences from countries like Holland and Germany seriously and do something fundamental.